I've been having the knitting blahs for a while now. Started something, put it down. Trawled ravelry for something new, came up uninspired. Ingrid prescribed Nuven for me, which at first I thought might have been a mothers little helper kind of pill, but turns out it's a gorgeous big wrap. Alas, I am not in possession of any Wollmeise Lace, although I'm sorely tempted by that magnificent emerald green that she made hers from, but it did get me thinking. How do you get out of the knitting blahs? How do you re-ignite that spark, the flurry of excitement when you cast on that's enough to pull you through the hard yards in the middle until the flurry of excitement when you're near the end and the little 'tada' moment when you finally cast off? I went to my ravelry queue and picked the one pattern that I've always badly wanted to knit but for some unknown self-sabotaging reason I've never started. Marlene Socks. I went to the garage, where that half of my life is packed neatly up in boxes. I got some of the knitting books out, and put them in a bookcase in the garage where I could see them. I found the marlene pattern. I got the yarn boxes out, and rotated them to a more accessible place. While I was there I noted on the boxes with a sharpie where the needles were, and the basic contents of the stashed yarn. While I was in there, I stumbled upon three skeins of Madeline Tosh MCN Sport in Grenadine, a recent shipment from the Magnolia Society Club - in the jewel toned range. The colour was so similar to the Marlene's in the pattern, but with more interest in terms of variation in colour. And then I cast on. BAZINGA! That yarn. Oh my god. It's like knitting with the actual pelt of a rabbit (without the eww and death of rabbit part). The fabric is as soft and squishy as a pair of flannelette pyjamas. The varigated yarn didn't pool, didn't flash, just mottled it's way through the easy and fun pattern repeats like it'd been created just for this sock. I didn't work on them every day, and some days only for a few minutes, but it must have been kismet. Because here I am with a finished sock, and it's mate already on the needles. The sport weight yarn made for a very quick sock, and the twisted ribs with decreases that look like cables but aren't give great texture. So just like that, hooked again. Maybe I'll have a crack at that Nuvem after all. oh my god, i cant believe youve already done one sock. that yarn really is gorgeous, and so perfect for that pattern. im glad to hear you might be knitting your way out of the blahs! There is a colorway called "Grenadine"????? Helloooo Christmas. 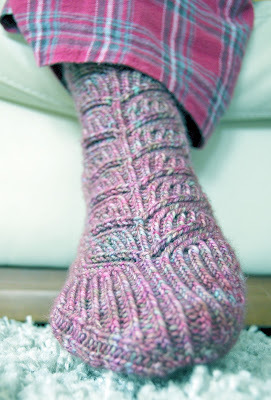 Love, love, love those socks and the yarn! Obviously you are a much cleverer knitter than I am. All those tricky bits in the middle of such stress - truly impressed. The socks look amazing. The yarn sounds wonderful. Great description of it. And lovely sock. Gods that's gorgeous! The pattern, the yarn... wow. Lovely pattern & the colors are so gorgeous. Great that you are back knitting again.